The Main North: Signalling the Broadmeadow to Werris Creek section my way. Now that there’s scenery on the Main North, there is more running of trains. 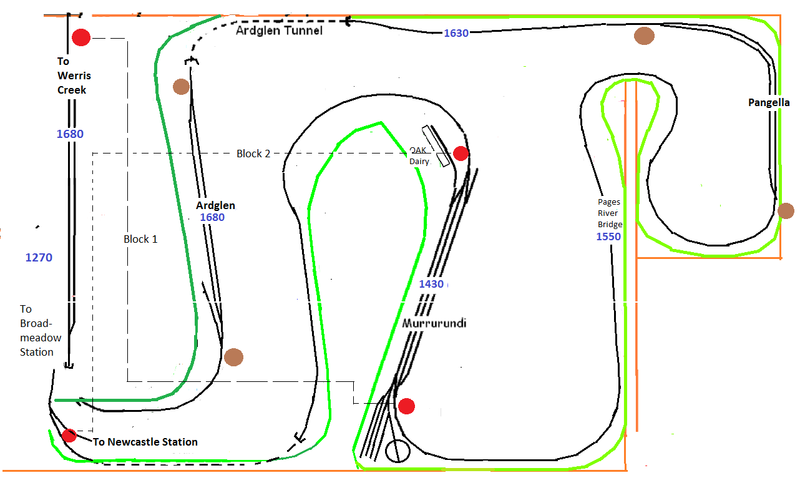 There have been a few “cornfield meets” on the 40 metre (130 feet) single line, from Broadmeadow as it “winds up” to Werris Creek, due to the “physicals” of the layout with the 3 peninsulas restricting the operators view of what’s happening elsewhere on the layout, shown it the diagram below. 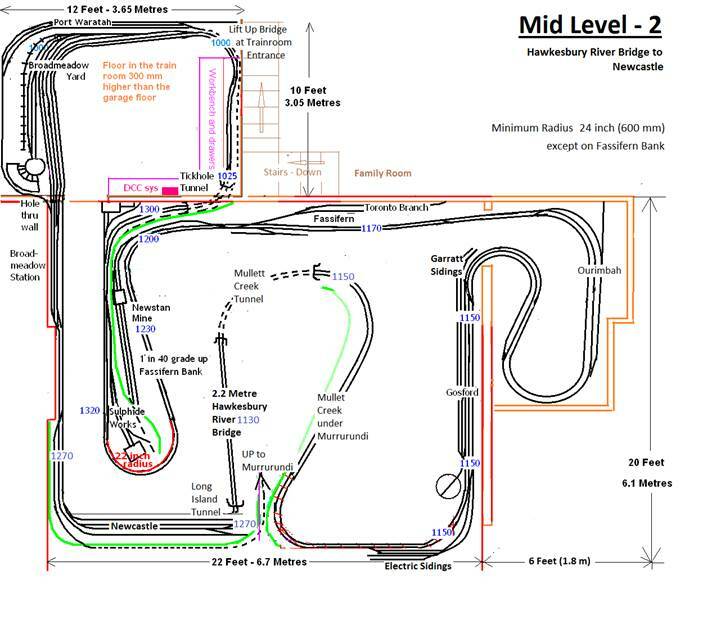 This section of track is crying out for some sort of “signalling”. Looking at the prototype and from the Signalling Clinics I have attended recently, I’ll need to add heaps of Semaphore Signals to each of the passing loops at Murrurundi, Pangela and Ardglen – lots of expense but mostly time to do this. In time it may get more prototypical but for now I’ll keep it simple to reduce the the “cornfield meets”. You’ll always have someone run against a red light. I have added two “blocks” to this 40 metre section of track. Block 1 – Werris Creek to Murrurundi and Block 2 – Murrurundi to Broadmeadow. The Yard at Murrurundi is not included for “my” occupancy detection as this makes the “job’ much harder, much more expensive and possibly with the chance of it never being completed. For the time being, I’m using CDA Colour Light Signals (Part No 131) and NCE BD20 Occupancy Detectors. Two detectors are necessary for my basic Signalling. Two signals are located at either end of Murrurundi Yard and one at the southern end of Werris Creek Yard and the fourth at the northern end of Broadmeadow, shown as red dots on the above diagram. When Pangela is completed and I have made 8 Semaphore Lower Quadrant signals and associated parts, I’ll replace the Colour Light signals and install Semaphores at Ardglen and Pangela (brown dots). The Colour Light signals will be used in Gosford. For the Werris Creek to Murrurundi block,(block1), as soon as a UP train leaves Werris Creek or a DOWN train leaves Murrurundi, both signals for that block turn RED, indicating to other operators not to leave Werris Creek or Murrurundi. Power is not removed for obvious reasons, just the signal goes red. The same for the second block. With the UP train arriving at Murrurundi, to make it simple, the operator will determine visually which road to use and select the appropriate Points. The 3 roads should never be full but I guess it will happen. The Occupancy Detector comprises of NCE BD20 that energises a Relay when there is "occupancy" (current gong to that block). A 1.0 Amp Bridge Rectifier with a 220 uF Capacitor connected to the DCC track, provides the necessary 12.0 Volts DC for the detector and the signal LEDs. It is as simple as that. The Relay “switches over” the “negative” for both Signal LEDs with the two signals wired in “parallel”. The two 1,000 Ohm resistors attached to the Relay. The Detectors are located at Werris Creek for block 1 and Murrurundi for block 2. Telephone cable is used to wire up the second Signal. Shown below is my detector. This “basic” easy to construct and install, Occupancy Detector works great – no more operators yelling is “anyone coming down from Werris Creek” etc. I wonder how long this form of signalling will be on the Main North. At the moment, no resistor wheel sets are installed, just the loco "tripping" the sensor. I may fit resistors to the Guards Vans. The scene below shows the Murrurundi “northern” Signal at Stop, “keeping” the rear end banked Down Mixed Goods, in the Yard until the Up mixed Goods arrives at Murrurundi Yard. I have temporally added a back scene to Murrurundi for evaluation. Now to build those Lower Quadrant Signals, purchase Mini Servos and Servo drivers etc but for the time being I'm really happy with my easy "Signalling" of this section of the Main North.